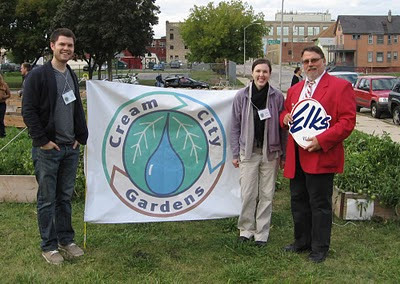 This past week, I had the opportunity to visit a 2011 ENF Cornerstone Grant project in Milwaukee, Wis. Elks scholar alum Karlye Rodriguez-Wisdom received a $500 ENF Cornerstone Grant to create an urban garden, called the Cream City Gardens, at the Guest House Homeless Shelter. 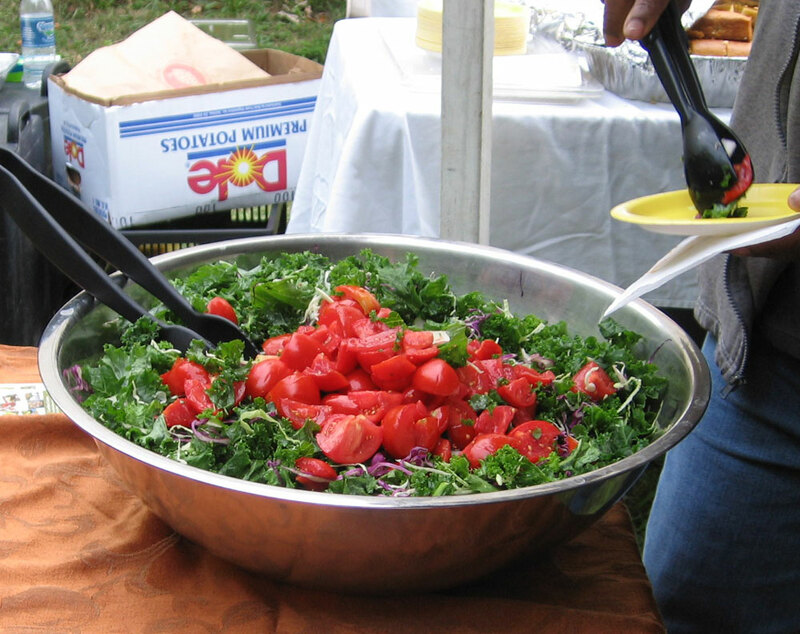 Now, a few months later, the garden is providing healthy, nutritious food to the residents of the shelter and Karlye is teaching them how to care for the plants. Ever since Karlye received the Cornerstone Grant this spring, I have been eager to see the project come to life. So I was thrilled when Karlye invited the ENF and the Milwaukee Elks to a Harvest Party to celebrate a successful season of gardening. Steve Vitale, a member of the Milwaukee, Wis., Lodge No. 46, joined me at the event where we got to see the Cream City Gardens in action. 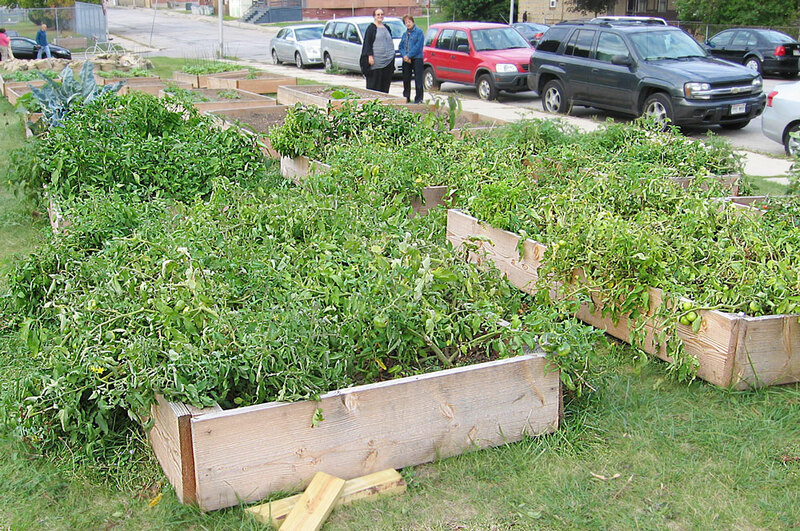 When I first laid eyes on 30 garden beds, it was clear how much hard work went into transforming a vacant lot in downtown Milwaukee into a thriving garden full of peppers, tomatoes and basil. But Karlye didn’t do it alone, she had the help of another Elks scholar alum, Tyler Ulbrich. They met while attending medical school at the Medical College of Wisconsin. The two told me they were surprised to learn about their common Elks bond when they applied for the Cornerstone Grant! Karlye and Tyler gave us a tour of the Guest House and showed us the fruits (and vegetables) of their labor. We saw multiple garden beds with sprawling tomato plants and the biggest cabbage plant Steve or I had ever seen. They even planted wild flowers to help beautify the land. While walking through the garden, Karlye and Tyler outlined their plans for the future. Before next spring, they plan to tear down a vacant building on the lot and greatly expand the gardens. At the end of our visit, we enjoyed a wonderful meal made with vegetables direct from the Cream City Gardens. As I looked at all the great work Karlye, Tyler and their team do for the Guest House and the Milwaukee community, I was amazed that they are able to take time out of medical school to give back to the community in such a meaningful way. But that’s what being an Elks scholar is all about, and Karlye and Tyler certainly exemplify what it means to be an Elks scholar.